'Proun' is a term coined by Russian Suprematist artist El Lissitzky in the early part of the twentieth century. 'Proun' does not have an exact definition, though Lissitzky stated that it was "the station where one changes from painting to architecture" or according to Wikipedia 'exploration of the visual language of suprematism with spatial elements'. The Proun works preoccupied him throughout most of his career and became formative in the development of the Utopian architectural projects he took up in later life. In Proun Room (or Prounenraum) the artist, designer and typographer, given a small room in which to display his work, rendered the ideas he had explored in 2 dimensions into 3. 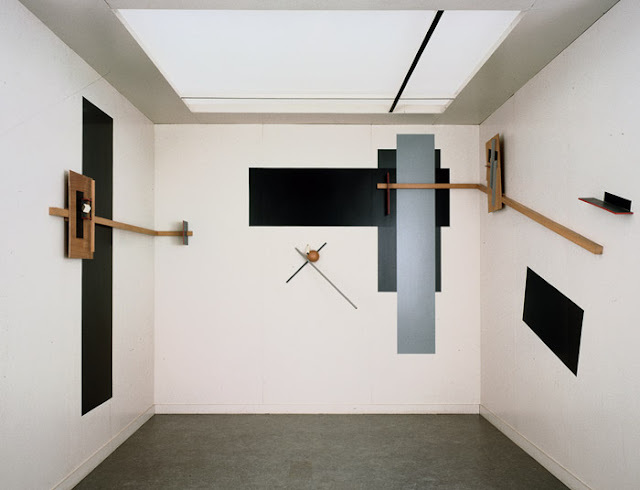 Navigating and circumscribing the walls with wooden constructions, Lissitzky plays with the perspectives and planar shifts we find in his drawings and prints throughout the room. The work remains a prototype for the installation art that would come later in the century. None of the original 1923 piece survived after its exhibition. Several reconstructions have been made based around a few photographs of the original installation, a lithograph and a painting since 1965 (more on that here).